There's a sophisticated tang to green olives—a little earthy, a little edgy, a whole lot voluptuous. 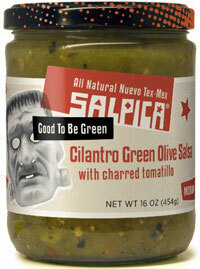 Salpica Cilantro Green Olive Salsa is made with roasted tomatillos and aromatic sweet garlic and crunchy onions where the green olive finds perfect buddies. This is a salsa that wants a piece of grilled fish or chicken to make it happy. 16oz. Tomatillos, Tomatoes, Water, Onion, Manzanillo Olives (Olives, Water, Salt, Lactic Acid), Cilantro, Serrano Chiles, Garlic, Lemon Juice, Salt, Extra Virgin Olive Oil, Sugar, Red Bell Pepper. All natural. No Preservatives.